2 Bedroom, 1 Bathroom With Rural Views in the National Park. Located in the North York Moors National Park, Spring Farm Cottage is only half a mile away from the National Park visitors' centre.The cottage is close to the beautiful market town of Helmsley, with its fantastic shopping, award winning delicatessens, cosy tearooms and impressive restaurants. It is also just 7 miles away from the bustling market town of Thirsk, the home of the James Herriot Centre and Thirsk racecourse. A super base to explore the Moors and its quintessential English villages, Castle Howard, the historic Byland and Rievaulx Abbeys and further afield to York and the Heritage Coast. A delightful stone cottage, recently converted from an old milking parlour, with a garden, outside seating and fabulous open views. There is a luxury bathroom, a well equipped modern kitchen, one double and one twin bedroom. There is a well furnished living area (free wi-fi) with freeview TV and a DVD Player. The cottage has contemporary decorations and finish, with underfloor heating throughout. The nearest great pub is just a mile and a half away, in fact there are three very good pubs within 3 to 4 miles of the cottage. Spring Farm Cottage is a single story dwelling previously converted from an old milking parlour and barn, and shares a site with the owners' house. It is a self contained property, being attached at one end to the main house. 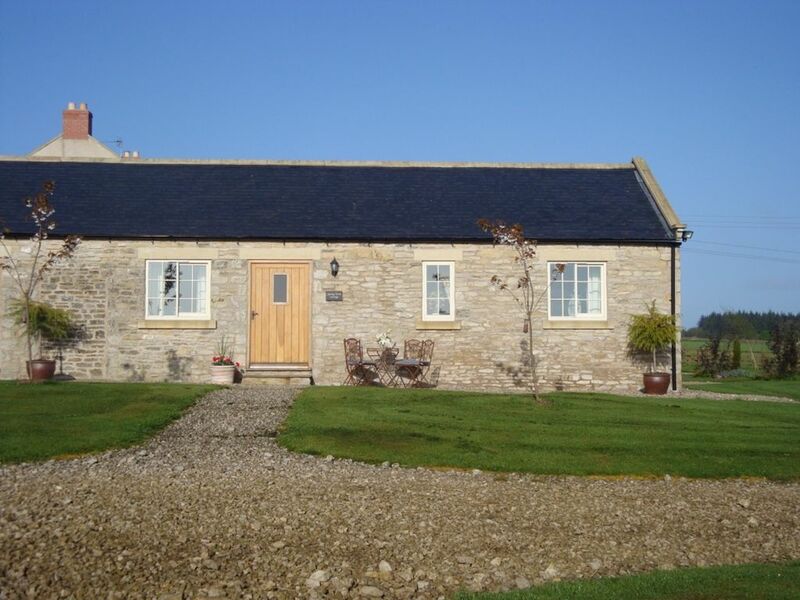 Spring Farm Cottage sleeps four, with a double bedroom and a twin bedroom. The living space is open plan with exposed beams and solid oak doors. It is furnished with a comfortable sofa and two armchairs, wi-fi, widescreen TV (freeview), DVD, a dining table and four chairs. In the dresser you will find a selection of books, board games and DVDs, plus plenty of books, local information leaflets, maps, walks and ideas of places to visit in the area. The fully equipped kitchen has granite worktops and stainless steel sink. It is well equipped with a 4 ring halogen hob, electric oven and grill, toaster, kettle, convection microwave, fridge with freezer compartment and an automatic washer/dryer machine. Cupboards are filled with plenty of crockery, cutlery, pans and dishes. The main bedroom contains a 5 foot kingsize bed with bedside drawers, dressing table/stool, armchair and wardrobe. The twin room contains two 3 foot single beds, each with large comfortable double duvets, with a bedside drawer, and wardrobe with additional drawers. There is a clock radio and hairdryer in each bedroom. The bathroom is tiled in Italian travertine and contains a bath with a shower over, wc and wash basin. A gravel pathway leads up to the cottage. The garden area is a lawned open area, with terracotta pots containing shrubs and flowers, two cherry trees are planted in the lawn and there is a wooden play frame with a slide and swings for children. There is a gravelled area where garden furniture is provided. There is ample off-road car parking next to the cottage. You can also make use of the main house’s barn for the storage of cycles etc. Children of any age are welcome. A travel cot and high chair are available on request. Please bring your own cot linen. The cottage is fitted with slate tiles (bedrooms are carpeted) with oil fired under floor heating throughout. There is unlimited hot water and all heating, electricity, bedlinen and towels are included. Sorry, no smoking inside the cottage. I am really pleased that you thought the cottage was lovely but I'm so sorry about the comment re the dogs...it's always worth texting me whether that would be OK particularly given the lovely quiet nature of your dogs. I am quite sure it would have been absolutely fine and I wouldn't have minded at all. I put "dogs not to be left on their own" as a precaution to protect the cottage against chewy(! ), young or noisy dogs or ones that may get distressed. Thank you for your important feedback. Really cosy and quiet little cottage. Perfect for a little get away! Very cozy cottage. Really comfy and warm beds. Fab views. Lovely spot near lots of walks and sights. We had a warm welcome from Lucy, her daughter and their cute kitten. We also enjoyed taking our own cat who loved the deep window seats and fab views too! Our kids enjoyed the friendly horses and exploring local castles etc. We enjoyed the welcome gifts too! Would definitely recommend to anyone. Thank you! It was great having a beautiful ragdoll cat stay. A first! So pleased you had a lovely stay. Great base, comfortable, Lucy is a wonderful, accommodating host. The property was spotless as normal. Had to ask to change original dates due to a change of circumstances Lucy arranged all this. The stars at night are amazing, comfortable seating and a lovely bed. This will be our first port of call when visiting this area. Excellent accommodation from which to explore the N. Yorkshire Moors. We thouroughly enjoyed are stay in this welcoming cottage, which was even more perfect with Lucy's kind gifts of food to great us. The rain only made the moors even more dramatic and did not dampen our holiday at all as we knew we would be returning to the comfort of our warm cottage. Great cottage in peaceful location, but not too isolated. -Arrival time is any time after 3pm. -Departure time is any time before 10am. -No smoking in or directly outside the cottage.